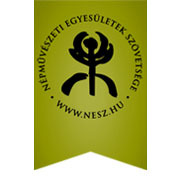 The Association of Hungarian Folk Artists ( NESZ ) is a 37 years old non- governmental organisation which gathers 59 Folk Associations, Craft Workshops, and Art Houses all over the country and across the border with a membership of more than 5 000 persons. Since its foundation the fundamental aim of the Association has been the support of the values of the Hungarian folk crafts, the alliance of people interested in the folk arts, and the creation of new regional associations and organisations. The task of the Association is the professional advocacy, the continuous contact with the member associations, and the art houses, the co –ordination of their activity as well as the ensuring of the mutual exchange of information. From the very beginning the Association of Hungarian Folk Artists organises and conducts events, exhibitions, fairs, professional applications, professional trainings, camps and conferences.